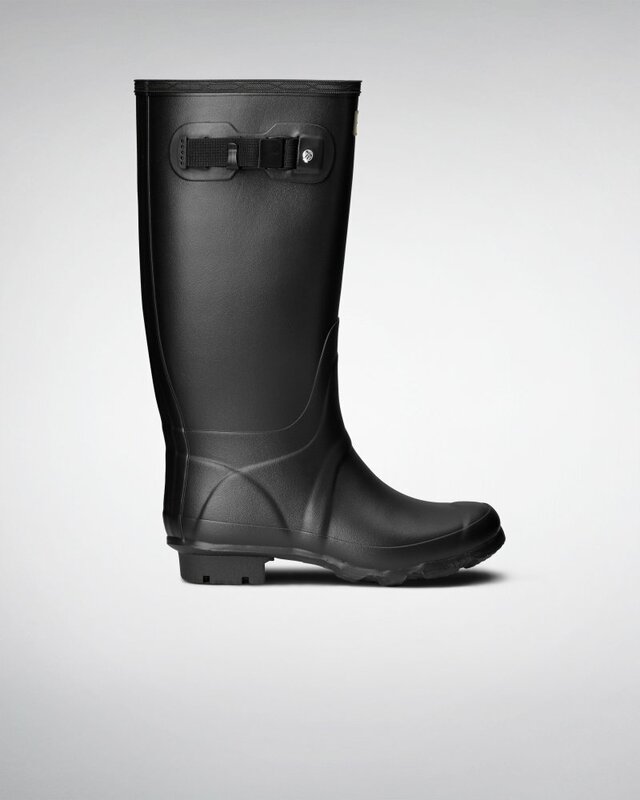 Women's Huntress Wide Leg Rain Boots is rated 3.9 out of 5 by 113. La bota de agua Huntress es un diseño duradero confeccionado a mano con un nuevo compuesto de goma blanda. Este modelo femenino incluye una altura de pierna más corta y pantorrilla más ancha para ofrecer una comodidad óptima. Con un dibujo en zigzag, la suela Argyll es duradera, proporciona gran tracción y evita que el barro se quede adherido. Rated 5 out of 5 by Kristine from Love is an understatement! To say I LOVE these boots is an understatement!! I originally tried the original boots but they were a bit to tall for me and I didn't like the narrow fit of the calf. I am 5'4" so about average in height and I have normal size calfs so these are great when I have thicker tall socks on over jeans!! Love them!! Rated 1 out of 5 by chezna from Does not hold up over time I bought these in June, 2016. I wore them during the rainy weather in Chicago, IL for the past 2 years. Never worn in hot weather because rubber makes me sweat. I should've taken them to the store I purchased them at before the warranty because maybe they would've accepted the return. They are cracked on the sides, where they fold around my calf while walking or standing, normal wear and tear. I just expect more from this product and the brand to last longer than 1.5 years ownership, but in actuality, 6-9 months of regular use, especially for the price you're paying. I think next time I'll get a pair from Old Navy every year at $25 and save the remaining $125 for something that will last longer and hold up to the price point. In terms of fit, they work well for short-legged people. Rated 5 out of 5 by Rizz83 from Perfect fit I bought this 3 weeks ago. Originally I bought the tall boots that fit was too small for my thick calves. I went back online and found the huntress boot. When they first came, and I put my feet in those boots. Perfect fit. I advise anyone who has thick calves buy the huntress. Super comfortable. And I love that I have room in my toes and calves for thick socks. Im a size 9 and I bought the size 9. Rated 3 out of 5 by Riann from Nice Boots The wide leg boot were definitely the right choice, but they still aren’t wide enough!